We have partnered with COOLSHIRT Systems® to introduce special full systems. This is everything you need! The Water Shirts work by circulating cool water through non-kink tubing around the wearer’s body. As this water moves through the system it takes the heat away from the body cooling you down. This water then flows back through the System Unit to a reserve of ice cold water. The circulating water automatically cools before being re-circulated around the shirt, vest or pants. 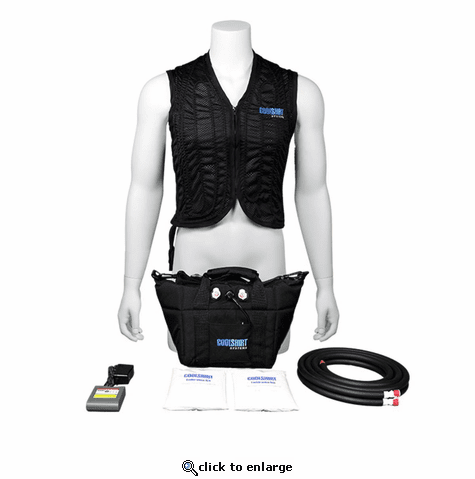 These non-toxic vests have a large pocket front and back in which a refrigerated, frozen, water or air conditioned cooled pack can be inserted. This flexible cooled pack will then help reduce the wearers’ temperature for up to 4 hours. These inserts can be refrozen as and when necessary. Each vest comes with one set of packs. For all day cooling we suggest ordering extra packs which can be kept in a freezer or cooler until it is necessary to exchange them.